With Mother’s Day right around the corner, it’s time to give back to the women that not only gave us life, but are often responsible for making our lives totally awesome. I know that not everyone is as lucky as I am, but I have to give my mom big props for being an amazing woman. I would not be where I am today without her love and support over the last 35 years – especially the last 15 years since I’ve been a mom myself! Why not give mom the gift every woman wants for Mother’s Day – a $25 Visa gift card so that she can pamper herself however she wants! Enter the Mother’s Day $25 Visa Gift Card Giveaway! Retweet this post (leave me the URL to your tweet) – this can be done daily! Everyone loves their mom and always wants to find the best gift to make her feel loved and appreciated. These are the gifts I have found and would love to share with you. After you enter my giveaway head over to Makobi Scribe to see her mothers day gift ideas worth over $3000. 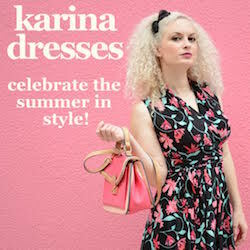 Then enter the grand prize drawing of a $1000 worth of Karina Dresses. This giveaway is open to US residents and ends at midnight on May 8th, 2013. Makobi Scribe Reviews, LLC or the Mother’s Day Gift Event Bloggers are not responsible for sponsors that do not fulfill their prizes. subscribed by email and confirmed. I follow on pinterest as sachas1234. Subscribed via iGoogle reader. Thanks! I subscribed for the newsletter (under my other email address). I follow you on Pinterest as nqdenise. Does this end on the 8th or the 18th? Picture says 18, you say 8. ??? I’m subscribed to your emails. I’m following you on Twitter @lisalmg. I’m following you on Pinterest user Lisa Garner. Signed up for your newsletter! I am subscribed to the weekly newsletter. I am subscribed via my cdlk1 yahoo email. I subscribe via email – just found your site..thanks for the chance to win! I subscribed via email! Thanks for the giveaway! I subscribed to the newsletter via email. I’m following you on Pinterest (Mail4Rosey).